A gym is in hot water after the questionable placement of a surveillance camera sparked furore online. But what made matters worse was the gym's cringe-worthy response which left many netizens angry and confused. 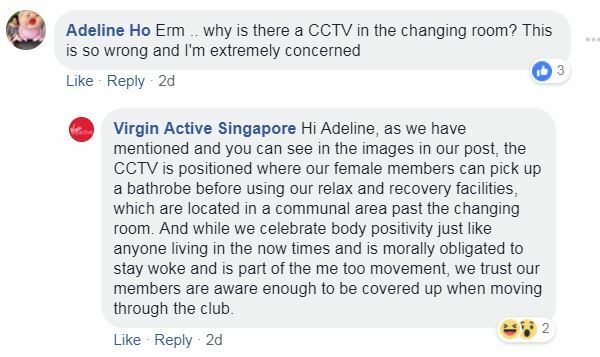 In a Facebook post on March 15, Virgin Active Singapore addressed concerns of a CCTV placed near what appears to be a changing room. In the post, the gym stressed that the camera "is pointed at a communal area where our female members can pick up a bathrobe to put on" before plugging their gym membership benefits. The post was accompanied by four images captured on CCTV, showing random gym patrons picking up bathrobes. Undoubtedly, many gym members took to the comments section of the post, expressing their anger over a CCTV camera that was placed near the showers without their knowledge. However, it was the gym's response to Facebook user Adeline Ho's comment that added fuel to the fire. In what seems like an attempt to relate to current social movements, Virgin Active Singapore said that patrons should be "aware enough to be covered up when moving through the club" in the era where people "celebrate body positivity just like anyone living in the 'now times' and is morally obligated to 'stay woke' and is part of the #MeToo movement". Of course, the remark only made members more displeased. Other people who were perplexed by the gym's response also started a discussion thread on Reddit. Eventually, Virgin Active Singapore apologised for the "lack of sensitivity" in its Facebook responses and said it has counselled the staff involved in the posts. The gym clarified that there are no CCTVs installed in the changing rooms and said it has put up temporary signage near the CCTV near the Relax and Recovery Zone to inform female gymgoers of its presence.